It had been three days since the election, and every day since was markedly different. Not because of any radical policy changes, rise in hate crimes or the predicated stock market crash, but because my body felt different. Even when intentionally distracting myself to quiet the numerous Facebook statuses, tweets and texts messages, I still felt it. It was everywhere yet nowhere all at once. The pervasiveness of white supremacy. On this particular day, I spent two hours in bed internally debating over the value of anti-Trump protests. Wondering if attending one would finally incite this sense of empowerment, moving me to fight back like so many white liberals predicted. Wondering if I would finally be able to process my thoughts, create a decorative sign and fearlessly mobilize to express my pain and disappointment to a nation that continually responds with indifference. I was numb, but not shocked. As a queer, Black, nonbinary person in America, I had no confusion about where I stood, the election only provided assurance. Trump’s election had not punctured any new wounds, but merely exposed existing ones. It is tradition for healing to be intercepted by the bullets dispensed by white supremacy, anything less would have been uncharacteristic. Trump’s nomination and election is in line with the murder of unarmed Black people, the denial of asylum to Syrian refugees, the detainment and deportation of undocumented folk, etc. America finally has a president whose morals and beliefs are consistent with its founding ideologies; why were white liberals suddenly spurred towards actions? Trump’s America is the same one that has always existed, the same one that people of color have been suffering under and calling out from for decades. Why now? The jolt of energy that I anticipated never came, but I somehow found myself at the protest, marching amongst a sea of white folks. It had become difficult, especially following Trump’s election, to consider white presence genuine. With over 58% of white voters electing Trump, it was clear that white liberals can show up to protests, change their Facebook photo, and check-in to Standing Rock, all while failing to truly commit to anti-racism. One of the fundamentals of solidarity/allyship/accompliceship is working within one’s self and amongst one’s communities to educate, and the exit polls showed that white folks haven’t been doing the heavy lifting. Prior to the election, encountering a white person who frivolously talked about their racist family members or friends voting for Trump was common. While they disagreed, offering hopeful words about progressive generations coming in to weed out bigoted ones, it was simply an accepted reality. Many of these self-proclaimed white allies have friends or family who elected Trump, yet still expressed surprise or disappointment, as if the votes and their implicit ideologies didn’t sit at their tables every year for Christmas dinner. 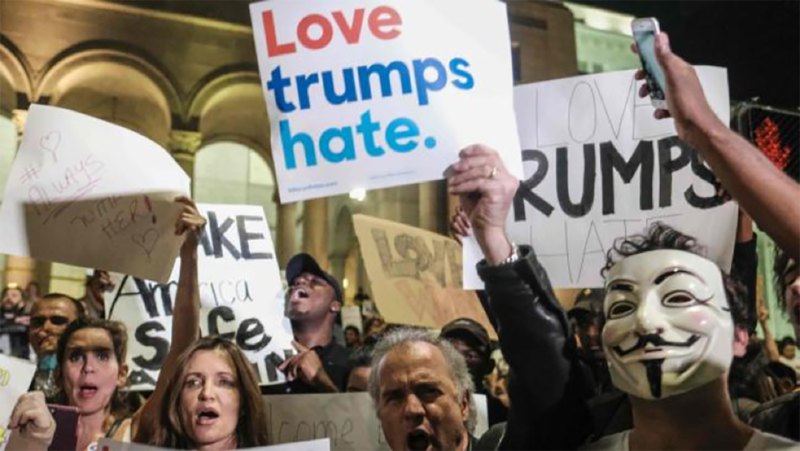 Walking through the march, I was further disturbed by the seemingly inescapable “Love Trumps Hate” signs, as well as the unabashed willingness of white folk to speak. Somehow, a vote for Hillary and some matching apparel deluded this group of white liberals into believing that they played no part in this. That their pins and stickers separated them from “those white people,” but white liberals seem to forget: this is on them too. This is on the educated ones, the millennials, the wealthy ones, and yes, even those who voted for Clinton. A Trump presidency simply wouldn’t have been possible without the unity of white voters. With the exception of college educated women, every subset of White voters overwhelmingly elected Trump. And in the instance of college educated women, Clinton led by a mere 6%. Millions of white people, having access to all of Trump’s demonizing rhetoric and transgressions, voted for Trump anyway. Millions of white people voted for a man endorsed by the KKK. Millions of white people either aligned themselves with Trump’s unabated racism or decided that it simply wasn’t significant enough to factor into their vote. Millions of white people were willing to conspire with a white supremacist because white supremacy is security. White supremacy is safety. White supremacy ensures that regardless of social strata, comfort can always be found in its alluring guarantee of never falling below people of color. Because it’s easier to resort to white supremacy to adjust unemployment or the dwindling middle-class rather than confronting the corporate capitalism that ships jobs overseas. White people must stop convincing themselves that white supremacy is upheld by a small minority, anonymously typing behind computer screens. and realize it is sustained by a silent majority. White supremacy elected Trump and white people need to start owning this.